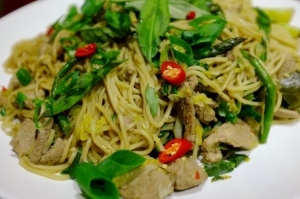 Easy Asian style noodles with lean pork and green vegetables. Finely slice the pork and season with some of the ginger and a dash of tamari. Steam the asparagus and finely slice the spring onions. Cool the asparagus under cold water to avoid over cooking and set aside. Heat a wok and add a dash of peanut oil. Quickly stir fry the pork and set aside. Add white part of the spring onions, cabbage, garlic, remaining ginger and stir fry until softened. Return the pork to the wok and add oyster sauce, tamari and sesame oil. Meanwhile cook the noodles according to packet instructions, drain, rinse under cold water and drain again. Add the noodles to the wok and toss though. Adjust seasoning to taste (a little more oyster sauce, tamari and sesame oil), garnish with coriander, the rest of the spring onions, sesame seeds, chilli and serve. Tips: This dish is quick and easy to cook once all your ingredients are prepared. Best served immediately, but if you need to cook extra for leftovers night leave out the noodles. 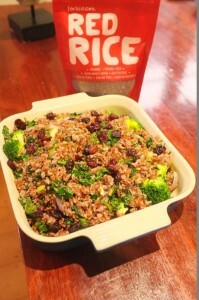 To vary the veggies, add steamed broccoli, bean sprouts and snow peas. Extra herbs such as Vietnamese mint and basil are yummy additions too. This is one of my favourite salsa/salad to have during the warmer months of the year. It's fresh, vibrant, a little spicy and has seasonal fruit and veggies that are delicious. Enjoy with grilled chicken, salmon fillet or with pulled pork in a corn tortilla. Drain and toss the corn kernels in a salad bowl then add diced avocado, mango and cucumber. Finely dice the jalapeño and onions then add roughly chopped herbs. Squeeze some mango juice over the top, season with salt to taste and a dash of olive or macadamia oil (optional). This simple chicken noodle soup recipe is an easy, low fat, winter meal that can be prepared while the kids are at school and even divided into portions and frozen for quick meals. Just be sure to freeze the chicken and stock only. It’s best to add the noodles and fresh leafy veggies just before serving. Make the stock – skin chicken and cut in half through the breast bone (it will cook quicker!). Throw in large stock pot with whole garlic cloves, ginger, celery, carrots, peppercorns, onions and herbs. Cover with cold water ensuring chicken is submerged, add salt; slowly bring up to boil then immediately lower to simmer and cook very gently until chicken is cooked through. Remove chicken and skim surface off any excess fat. De-bone the chicken and shred into bits, it should come away from the bone and be very tender and juicy then strain the broth removing everything and return to the pot. Throw the carrots back in and add the fresh veggies. Meanwhile cook the noodles in a separate pot, drain and rinse. Don’t over cook the noodles or it will turn into clag! The noodles cook within 3-4 mins. Once the veggies are cooked, fill your bowls with some noodles, ladle over broth and veggies and top with the shredded chicken. Serve with fresh coriander, red or green chilies (seeded and chopped) and chives. Fresh bamboo shoots are great too! Variation: Once the stock has been strained, return it to the pot and add 1/2 cup of Shao Hsing wine, few splashes of Tamari, and palm sugar to taste. This salad recipe is another example of a low GI high fibre food which is highly nutritious and will sustain your energy and hunger levels all day. Soak a pinch of saffron strands in hot water or stock and allow to steep until ready to use then lightly steam and char grill the beans and asparagus. Dice the pumpkin and eggplant into chunks and slice thick chunks of the capsicum. Arrange on a baking tray. Crush and mix the ginger and garlic into a bowl, add the cumin, olive oil and salt. Smother the veggies, and bake in oven at 150 degrees until tender or if you’re pushed for time, bake at 180 degrees and keep and eye on the eggplant and capsicum which will cook quicker than the pumpkin. Alternatively, par boil or steam the pumpkin to speed up the cooking time – allow to cool. Cook the freekeh according to packet instructions adding the soaked saffron. Transfer to a salad bowl and toss through the veggies and herbs then drizzle with a dash of olive oil and lemon juice to taste. Variation: toss through marinated goats cheese fetta…Yum! Ordinary root vegetables made amazing. This is a filling vegetarian meal on it’s own or a colourful accompaniment with grilled chicken, steak or lamb. Wash and chop carrots into round chunks (no need to peel). Throw it in sheet of foil. Fold the sides up to create a pocket and add the fennel and cumin seeds (lightly crushed), salt and pepper to taste, dash of olive oil, water, lightly bashed garlic cloves (unpeeled) and a sprig of thyme. Wrap and bake in a hot oven until tender. Prick and wrap beetroot. Bake in a hot oven until tender. NO seasonings of any sort needed. Once both are cooked and slightly cooled, peel and dice the beetroot. Toss both in the same bowl, crumble fetta over the top with roughly chopped fresh parsley and mint; drizzle with olive oil, toss and serve. Another veggie salad flavoured with middle eastern spices. This salad works really well with chicken. Slice the red onion finely and place in a small bowl sprinkled with a large pinch of sea salt and set aside. The salt will draw the moisture out of the onions leaving soft, sweet onions which makes a delicious garnish. The longer you leave it to soak the better the result. After cooking everything else, squeeze the excess moisture from the onions, rinse if necessary before adding it to your dish. 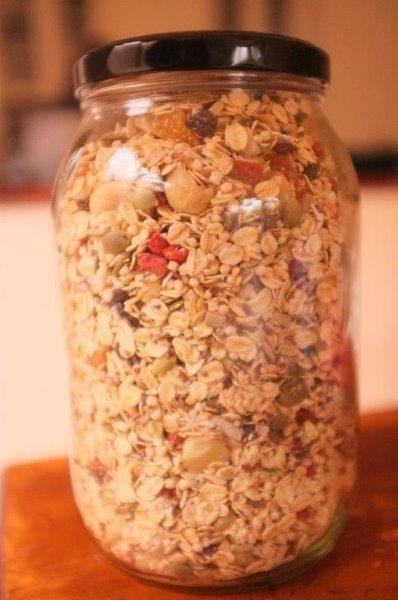 This can also be prepped ahead of time. Pat dry the eggplant then toss with the spices and a little olive oil. Slowly pan fry with the bay leaf or use a griddle pan. Drain any excess oil on kitchen paper. Steam the asparagus and cool. Toss both veggies in a bowl with the herbs, sprinkle with extra sumac and stir through the onions. Adjust seasoning to taste. Stir it all together and spoon over your cutlets.